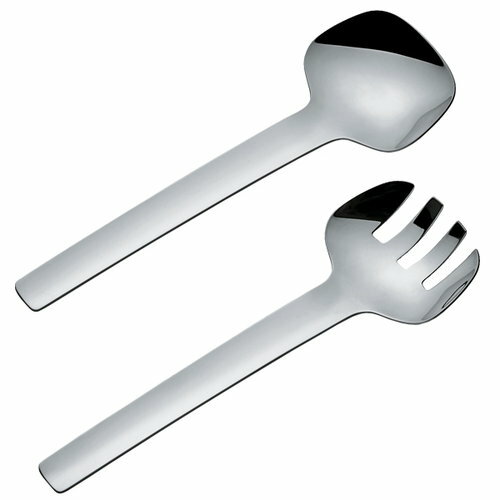 Kristiina Lassus designed the Tibidabo serving tools for Alessi between 2006 and 2007. 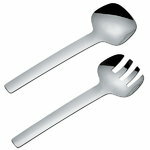 Tibidabo is a collection in 18/10 stainless steel mirror polished and include a general serving set, a salad set, a rice and vegetable spoon, a spaghetti serving fork and spaghetti tongs. The Tibidabo range brings stylish and functional Nordic simplicity to every table setting and was awarded the Red Dot Design Award in 2008. Kristiina Lassus is a Finnish designer and creative director who graduated from the University of Industrial Arts of Helsinki in 1992. Kristiina Lassus (b. 1966) is a Finnish designer, architect and creative director who graduated from the University of Industrial Arts of in Helsinki (UIAH) with a Master of Arts (MA) in Design Leadership in 1992. This was followed by postgraduate studies in product development at the Helsinki Polytechnic in 1993, and her second MA in Interior Architecture and Furniture Design from the UIAH in 1995. After finishing her studies in Finland, she moved to Italy where her creative potential has truly flourished. Her particular flair for décor and colour, coupled with her instinctive curiosity for other cultures, brought her to travel the world and live in many countries. Upon her arrival in Italy, she designed for several companies including Poltronova, Zanotta and Alessi where for six years she was design manager. In 2003, she created Kristiina Lassus Studio, offering consulting work in art direction, design, visual communications and interiors. Her creative eclectic outlook recently brought her to a very engaging passion for rugs that she designs and are then handmade in Nepal and in India with thoroughly natural materials, following traditional craftsmanship techniques, and using colours, motifs and decorative patterns with elegance and lightness. In her dual role of designer and entrepreneur, she follows personally the overall production of the rugs: the result is a collection of small masterpieces in their own right. The Rugs Kristiina Lassus collection received in 2008 and 2010 the prestigious Red Dot Award, one of the most important design recognitions world-wide.